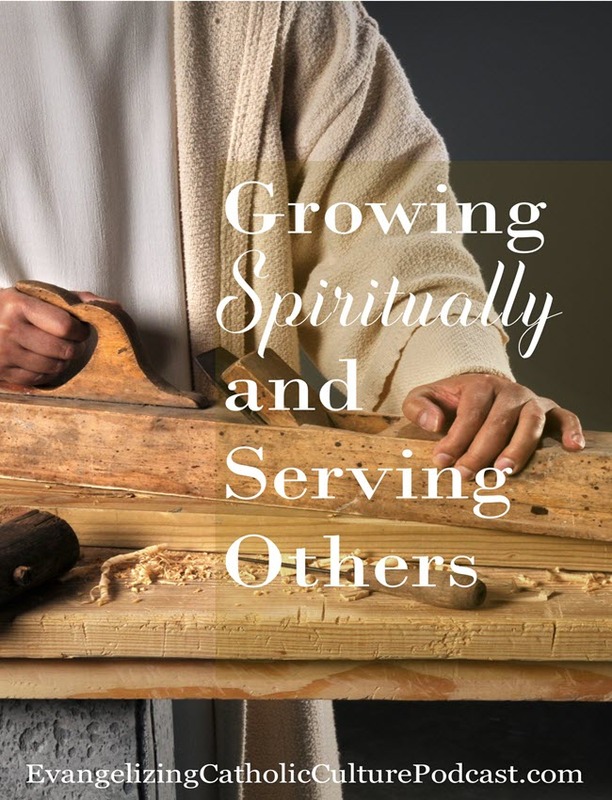 In this episode, we will explore ways to grow spiritually and serving others. The “anointing” referred to here is the gift of the Holy Spirit given to the baptized, source of wisdom and understanding. The Jerusalem Catechizes, presented in the Liturgy on the Octave of Easter Friday also speaks about the anointing with the Holy Spirit. “When we were baptized into Christ and clothed ourselves in him, we were transformed into the likeness of the Son of God. Having destined us to be his adopted sons and daughters, God gave us a likeness to Christ in his glory, and living as we do in communion with Christ, God’s anointed, we ourselves are rightly called “the anointed ones.” When he said: Do not touch my anointed ones, God was speaking of us…But we too have been anointed with oil, and by this anointing, we have entered into fellowship with Christ and have received a share in his life. This year we are now in the midst of celebrating the great season of the Pascal Mystery. It is the heart and core of the life and power of our Christian life. As Pope Benedict XVI proclaimed, during the Vatican Council II, the Paschal Mystery is the heart and center of the Council’s teaching, and as such is the heart and core of a Christian’s life. How should we view this very clear teaching in relationship to the Church’s Grace of Renewal? In the spiritual renewal movements, the approach is usually a seminar which prepares one to be prayed for “a new empowerment of the Holy Spirit.” There is plenty of evidence of the wonderful things that happen for a person who has had this experience, and if one feels drawn in that direction of renewal, seeking to receive an empowerment of the Holy Spirit, a new special grace of spiritual refreshment, I highly encourage it. However, I am proposing a different approach to a similar reality, which I have called the spiritual experience of the Church’s Grace of Renewal and Reform. The basic scriptural reference that I suggest is the Easter Sunday night experience of the disciples gathered in the upper room, recorded in St. John’s Gospel (Jn.20: 19-23). The heart and core of this approach is the full gamut of the Paschal Mystery, which includes the sending of the Spirit by the Father and Jesus. Certainly, we would need a preparation program including a series of teachings. The prayer of spiritual anointing and commissioning at its conclusion could be termed, the Baptism of the Spirit in the Paschal Mystery. The starting point of the threefold empowerment of the Resurrection, the Cross, and the Spirit would be the experience of the Glorified Risen Lord and Savior. It would also certainly include the empowerment of the Spirit and the Spiritual Gifts. It is with this understanding in which I am presenting four opportunities to provide for others some tools for growth. In a previous reflective teaching, I presented some tools that focused on spiritual growth for individuals. Now in this teaching, I want to present a few tools that focus on group opportunities for others who may be seeking a relational program that is ongoing and growth producing in holiness of life. This reflective podcast teaching is going to concentrate on four opportunities which the podcast sponsors or supports for serving the spiritual growth of other brothers and sisters. In outreach, to others, this teaching is going to review the possibilities of serving a person or a group of individuals, who may want to be in relationship with others for the ways and means of spiritual growth and/or service to others. These four opportunities are ways of doing Evangelization. The first tool which we want to consider is Power Focused Intercession. This means of growth, healing, and empowerment for others is looked at in some of the other podcast presentations. (The Path to Spiritual Freedom) Some of us may feel a real disconnect when we pray for others, or In the “Universal Prayers of the Faithful,” when it is hard to connect with the petitions. So we may settle for a dry cerebral or a disconnected prayer. We don’t seem to have a dynamic connection with the individual or group we are praying for. This doesn’t mean that our intellectual prayer recitations for others are not blessed by God, they are! But what we want to try and do is proclaim and promote that we can have a connected grace-filled experience when we pray for others, which comes from our hearts and is experientially based. Where real change and miraculous results in the lives for whom we pray are happening. Recognizing that in this approach we are exercising the beautiful truth that we are members of the Mystical Body of Christ, and Jesus wants to give to us an invitation to join him in ministering a powerful happening in grace for the benefit of others. The key is in knowing how to connect up with the powerful working of the glorified Lord’s grace for the specific needs of an individual or group. The simple formula: I am sorry for all the hard, painful, and difficult things that have happened to you. I take limitless responsibility for all that has happened to you! Please forgive me. I love you. Thank you. Now before we are tempted to begin a rationalization that finds some difficulties, let’s take a look at how this formula is prayed in a direct union with the Lord himself. We are members of the Mystical Body of Christ, by virtue of our water Baptism. We are in a dynamic personal relationship with the glorified Lord Jesus and one another. We are all the Body of Christ. This truth is the foundational truth in which we begin our intercession for another person or group. The night of the Resurrection the glorified Jesus, who had already ascended to the right hand of the Father appears and says, Peace be with you! (Shalom!) It is done! I have accomplished it all! It is over and done with! Jesus gives the disciples and us the full experience of the Paschal Mystery. He breathes on them and says: “Receive the Holy Spirit…”, and commissions them to do also with others what he has accomplished and gives to them, and he will do it in them! In Romans chapter 8 it says, that both Jesus and the Spirit do intercession for us. When we express our sorrow for the person we are praying for, we immediately leave our mere human desire and place ourselves in the heavenly plane; in total union with the Father, Son, and Holy Spirit. We have just entered the supernatural realm. We then picture the person or group we are praying for and we enter into union with our glorified Lord and all that this means in light of that event, the Lord does the actual intercession, reparation, atonement prayer in which we are with him for he has accomplished it all! So when we take limitless responsibility we are doing so in union with the Lord. So we should never take on the negative or destructive attitudes of the one we are praying for. So as we say, “please forgive me” it is the Lord who is acting in power. When we say I love you we are doing so truly with our human ability but now joined with the love of the Lord for that person. In this is the power we have of sharing in a miraculous power of love to change and heal another human being. And when we say “I thank You” we are “divinely” acting to affirm and identify the full purpose in which God has created that person. This prayer of “power focused prayer” is a ministry and mystery of Love! When this procedure is a Spirit-led Experience and performed primarily with the heart, one will actually feel the powerful presence of the Lord working in a mysterious manner. Now, this is so good! When one does this prayer of cleansing, the individual will also feel the cleansing and healing going on in oneself. Therefore, while we are doing this mission of love for another person, the Lord is doing a work of tender healing and cleansing in the one praying. “Two sides of the same coin” The way to really learn the experiential truth of all this is by practice, practice, practice! The more we do this the more we are drawn into the power and the more we experience the cleansing power in our own life. The first key is to stand in the experience and truth of faith and practice life-giving repentance. The second key involves forgiveness: seeking forgiveness from God, forgiving others, and forgiving oneself. It also means giving forgiveness to others in all situations of life where I have been hurt or offended. The follow through in this key is after forgiveness then let things go and surrender them to the Lord, the icing on the cake is praying for those who have sinned against and hurt me. The fourfold features of completed forgiveness. Because all four are exercised it brings closure in the process of forgiveness. The third key is the acknowledging and renouncing in the name of Jesus, the identified attitudes and the spirits of darkness, which have been oppressing, harassing and working in one’s life. The fourth key is taking authority in the name of Jesus over these entities and commanding them to leave. The fifth key is finally praying with the recipient for the Father’s love and blessing. This blessing confers grace for the recipient in which they experience that they are a beloved son or daughter of the Father, and they are especially loved by God. Fire Groups: A source for helping people make changes in their life, and living the Christ-Life. Fire by its very nature has the ability to make changes in things. However, it is primarily used symbolically in Scripture. One may recall Moses seeing the bush on fire but not burning up; representing God’s awesome holiness. It purifies one from the dross of sin. It illuminates the mind and enables one to see what is pleasing to God. In the human person, the symbol of fire illuminates the mind, energies of the will, and gives strength to the soul. In relationship to personal holiness, it inflames us with love. In the recent past in this country FIRE was used as an acronym to identify changing ones life and living a new life in Christ. At this time it is useful to identify a flexible small group opportunity that meets occasionally to help one another grow more deeply in the Lord. Merciful Christian Fellowship Groups: Fields of Compassion. Some decided to research and then provide the opportunity for those who desired to develop this approach of small groups, where individuals kept track, openly reported results and failures, and were held weekly accountable. The results were amazing! Individuals lost weight easily and consistently. The success of this communal relational endeavor was quite impressive. One of the lessons of this group centered accomplishment was the huge success that happened when individuals quit trying on one’s own and joined in a group effort. The Church in this country is just beginning to appreciate the value of small fellowship groups developed to aid one in growing in Christian holiness and maturity. “Evangelizing Catholic Culture” Podcast will eventually be providing two types of small group fellowships for the purpose of growth and support in the Christian life. The first one is FIRE Growth Groups mentioned above, and the second one is Merciful Christian Fellowship Groups. The Merciful Christian Fellowship Groups are designed to help individuals grow in living a committed Gospel form of life. The MCFG’s are designed to provide a flexible formation experience as a modern penitent, to assist individuals to grow and share one’s faith, and training to do some type of evangelization or mercy service. Who may want to take a look at this opportunity? Anyone who has a personal relationship with Jesus, and feels called to deepen their skills in prayer and outreach to others. Anyone who wants to grow in the use of the spiritual gifts and qualities of mercy by practicing the spiritual and corporal works of mercy. Anyone who enjoys prayer and desires personal transformation, and formation in the life of grace. Anyone who wants to grow more comfortable and skilled in sharing their personal faith story.